If you owe money to the IRS or the state or face other serious issues involving your taxes, you are likely stressed and unsure where to turn for help. In addition, our law firm also offers comprehensive, solid estate planning and administration services to help you protect yourself and your loved ones for the future, and we can represent your interests during all stages of probate and trust administration as well. Holding a Master of Science in taxation as well as being a certified public accountant, Mr. Karos possesses the skills and resources necessary to handle your case regardless of how serious or complex your situation. With more than 20 years of professional experience, he can advise you of your available options to help you make the best informed decisions about the matters that affect your case in order to help you achieve the best possible outcome. 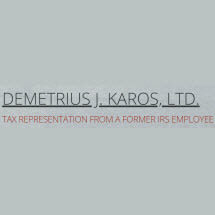 To find out more about how Mr. Karos and the dedicated legal professionals at Demetrius J. Karos, Ltd., can best serve your needs, you can contact our law office to schedule an appointment for a consultation.